Thailand has always had a reputation for some delicious dishes that are not only great on your taste buds but also healthy to eat too. However, whilst many of Thailand’s best dishes are extremely good for your health, the myth that all Thai food is healthy is not true at all. Thai food has gained this great reputation mainly because they use natural ingredients and pack most meals with lots of fruits and vegetables, yet this does not always guarantee that a meal is going to be healthy one. One good example of a very popular Thai dish that is not as healthy as it tastes, is their world renowned green curry. This is usually packed full of vegetables such as green chilies, eggplant and aubergine, which would suggest that the meal is a fairly healthy one. However, it is also full of coconut milk, which when consumed regularly will do nothing but pile on the pounds. Just half a cup of this stuff contains 200 calories and more than a whole days worth of recommended saturated fat consumption. Still, we all love a green curry from time to time and everything in moderation is not such a bad thing. 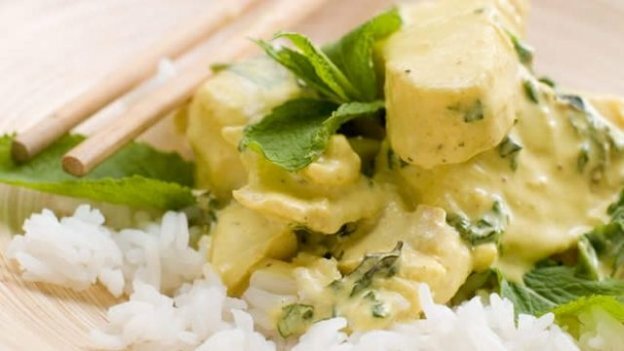 So we now know about green curry, so what other Thai dishes should we avoid eating regularly? Another Thai curry that is delightfully delicious but this one brings a calorie count of 760 per serving. This is because it contains more coconut and cream than any other Thai curry. It is known as being the richest curry in Thailand and it is no wonder why when you consider it is made from either duck or the fatty parts of beef. Musamun Curry is definitely one of those dishes that you should consume rarely as too much of a good thing is usually a bad thing when it comes to food. Otherwise known as Tom Kha Goong, Coconut Shrimp Soup does even worse than Masamun Curry with regards to saturated fats, as one serving will fill you with two times the daily recommended intake. On top of that a serving will contain 528 calories, so you really should be looking elsewhere if you really are in need of some coconut based curries. Pork Panang is yet another Thai curry and whilst it is slightly healthier than the others listed, it will still see you taking on 634 calories per serving. Those calories could be cut quite drastically however, if you swap out the pork for some shrimp instead. This will get you a saving of 120 calories and make it a far healthier proposition.